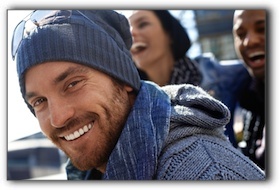 Home » Cosmetic Dentistry » Want A Reason To Smile All The Time? If you are not happy with your smile, we invite you to consider a complete smile makeover. 1. Look and feel younger. 2. Improve your oral health. 4. Smile all the time! Hello, I am dentist Goel Sanjeev. Welcome to my dental blog. I serve my patients at West Chester Dental Group which is located at 5900 W Chester Rd Ste A in West Chester, Ohio. I have been practicing general and cosmetic dentistry since 1994. There has never been a better time to practice dentistry because dental procedures unavailable just a few years ago are now commonplace. During my career, I have become proficient in a wide variety of advanced dental treatments aided by breakthroughs in techniques and tooth restoration materials. My passion is providing the highest standard of dental care for my Cincinnati area patients and creating the healthiest and most beautiful smiles possible. If you are not familiar with the latest dental procedures, you might not realize what cosmetic and restorative dentistry can achieve. A total smile redesign involves a combination of cosmetic dental procedures which may include dental crowns, porcelain veneers, dental bonding, tooth implants, inlays and onlays, gum contouring, teeth whitening and, in some cases, orthodontia. If you have dental anxiety, we can help. Sleep dentistry, sometimes called conscious sedation, will calm your nerves and help you relax while you undergo your smile transformation. If you are in the West Chester Tri-State, Butler County, or Mason area and have cosmetic dentistry questions, schedule a consultation by calling us at 513-942-8181.